We’d love to see how you’re using fresh produce from local farmers! We hope to gather a list of recipes from employees, faculty, staff, students, and members of the community. Recipes and accompanied pictures (optional) will be posted on Goodwin’s Farmers’ Market webpage so others can get ideas on how to prepare, cook, and use the many produce options found at Goodwin’s Farmers’ Market. If you want a healthy alternative to potato chips try this delicious version! Kale is a hearty vegetable that tastes great in soups while still maintaining its texture. Try this healthy and satisfying recipe. If you’d like to share any recipes please contact Hannah Stacy at HStacy@goodwin.edu or Sandy Pearce at SPearce@goodwin.edu. It’s time to don the leather jackets and practice the hand jive as Goodwin College gets ready to bring Grease and a nostalgic drive-in experience to campus. On Friday, Aug. 2, Goodwin will continue its Movies Under the Stars series with a screening of Grease. The community is invited as the campus is transformed into Rydell High, complete with costume contests with prizes for the best in T-Birds and Pink Ladies. The movie will begin airing at 8:30 p.m. on a 40-foot screen. As a drive-in, the audio will be broadcast directly through car radios, allowing guests to enjoy the film without falling prey to mosquitoes. There is no charge to attend the movie. Refreshments will be on sale during the viewing, which will take place in the main Goodwin College parking lot. Visitors should route to 211 Riverside Drive in East Hartford. Prizes for best costumes include gift certificates to area restaurants. Vintage cars from the 1950s will also be on hand for the evening. Set at the end of the 1950s, Grease tells the story of suave Danny (John Travolta) and his relationship with wholesome Sandy (Olivia Newton-John), set against the backdrop of the melodrama of their respective groups of friends. Adapted from a Broadway smash hit, the soundtrack is one of the most popular recordings of all time. For more information, log onto www.goodwin.edu. On a July 2013 field trip, Goodwin’s Summer Bridge Manufacturing Technology Program, a six-week, full-scholarship program that introduces students to a collegiate setting where they are able to earn up to six transferable college credits, ventured to Alpha Q, Inc., a manufacturing company in Colchester, Connecticut. Richard Hurley, CFO and General Manager of Alpha Q’s AQ division, led the 10 eager students as they toured the clean facility with the whir of machines and workers executing their jobs with speed and grace in the background. Alpha Q manufactures parts for a variety of aircraft mediums as well as land engines, working with companies such as Rolls Royce, General Electric, Honeywell, and Sikorsky. “Manufacturing is a great industry. There are a lot of well-paying jobs in Connecticut. It’s a strong business, and I highly recommend you pursue it as a career,” Hurley explained. Positions in manufacturing range from highly educated engineers to students who begin work right out of high school, with a wide variety of jobs in between including assembly work, precision inspection, machining, and controlled lab work. “To work in manufacturing you must communicate well, work hard, and be prepared, positive, and always willing to learn more,” Hurley commented. On the tour, students watched a groove being cut into a stainless steel part, studied an operation process sheet, and examined tools, turning centers, and grinding equipment — all while asking thought-provoking questions of both Hurley and Tim Duggan, Continuous Improvement Manager. While some students were interested in the power of the machines, others focused on the precision of the workers in charge of the robots. “Machinery and operations interest me the most,” said Summer Bridge student Randy Menard, 18. Currently, four Alpha Q employees are enrolled in the Certified Production Technician Program at Goodwin College to enhance their abilities and increase their opportunities for advancement. Danielle Moorcroft graduated from a tech high school, began her career in the tool crib at Alpha Q, and is now furthering her education at Goodwin. “Manufacturing is not a male-dominated industry. We need females in this field,” Hurley noted. Moorcroft made it evident that females can do this type of work just as well as men. As recent high school graduates, this trip brought light to the fact that a manufacturing career is an attainable goal. “The students got a healthy and positive dose of reality. They were able to see people their own age working in this setting,” said Michael Wolter, Assistant Professor and Organizational Studies Co-Director. Manufacturing is steadily on the rise and Goodwin is in full support. “The average age here is 50. A lot of people don’t go into trades anymore. We need the next generation to step up and become interested,” Hurley noted. Organized and precise, employees show great pride in their work, cleanliness and productivity. Employers strive to support and mentor new employees. “Alpha Q is heavily focused on mentoring, guiding and teaching new employees,” said Al Pucino, Manufacturing Management Director for the Department of Social Science, Business, and Education. 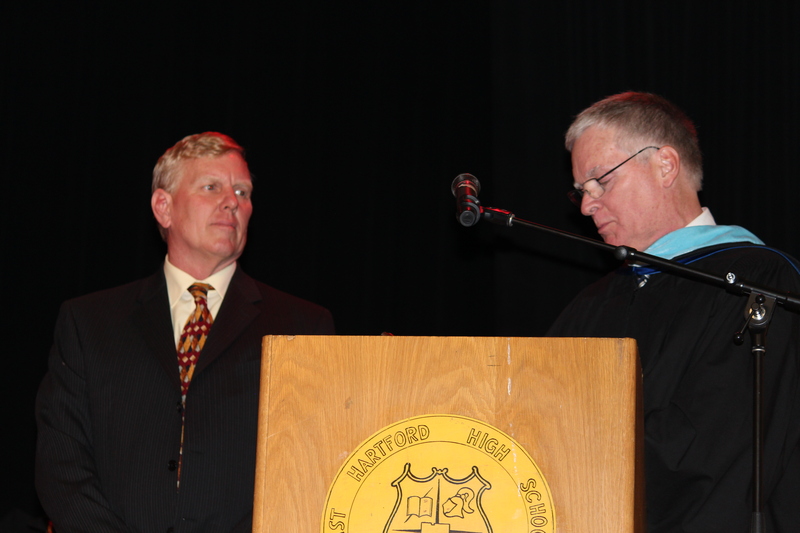 Hurley encouraged the students to be proactive in all aspects of life, including their education and career. “Take advantage of the opportunities at Goodwin. Be open to learning new things and have a desire to advance your career,” he said. Taking the students to a manufacturing site proved to be extremely beneficial. “It really brought the classroom experience to life,” Wolter observed. Not only was the trip a success, but it was also an opportunity to network. “Six of the 10 students enrolled in the Summer Bridge Program said they planned to join the Manufacturing Program at Goodwin. It was a really positive experience for everyone,” said Chip Thermer, Manufacturing Program Administrator for the Department of Social Science, Business and Education. Ashleigh Custer, 17, graduated from Howell Cheney Technical School in Manchester and is hoping to make manufacturing a career in the near future. “Manufacturing is something I want to look into. I had a good experience in high school. I think it would be a good career choice for me,” Custer said. Goodwin College hopes to facilitate the growth of those who want to pursue a career in this highly essential field through quality training and education. Goodwin College is bringing all the fun of the Ferris wheel and carousel to campus in late August, all for the benefit of student scholarships. The Goodwin College Summer Carnival makes its debut on Saturday and Sunday, Aug. 24-25. 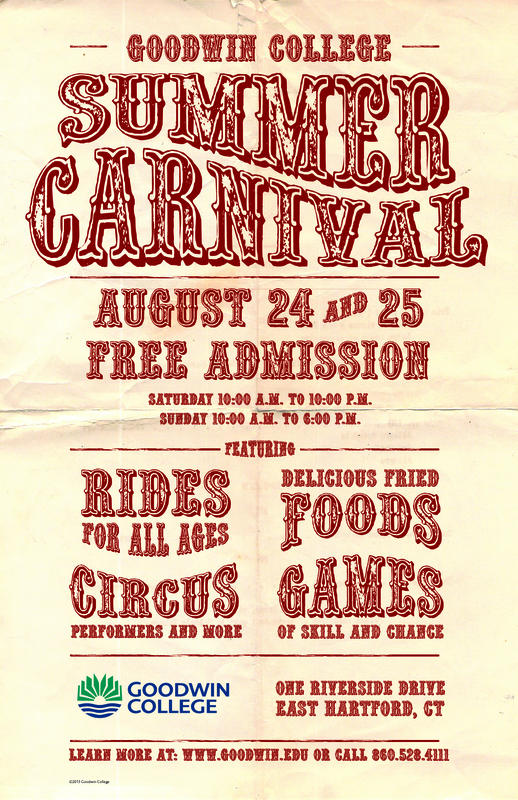 Admission is free to enter the Carnival, to be held on the Goodwin College River Campus on Riverside Drive. The Carnival will take place Saturday from 10 a.m. to 10 p.m. and Sunday from 10 a.m. to 6 p.m. The Carnival is a first for the College, which hopes to establish a new tradition, set for a weekend in late August just before children return to school. There are no other carnivals or fairs scheduled to travel to East Hartford during the Summer or Fall. Visitors can buy tickets for a variety of rides, including a Ferris wheel, flying swings, merry-go-round, giant slide, and more. There will also be kids’ rides, game booths, and all the carnival food favorites from fried dough to funnel cake. “We are delighted to bring the fun directly to our campus and to East Hartford as a whole. The Carnival will give our students, families, and employees a chance to celebrate the season with our families and friends,” said Jennifer Henry, chair of the College’s Student Experience Committee, which is planning the event on Goodwin’s behalf. In addition to rides, games, and food, a circus troupe of acrobats and other performers will entertain guests of all ages. Proceeds will benefit the Goodwin College Foundation, the College’s fundraising arm that supports student scholarships. The Foundation raises millions of dollars to support the College’s mission of providing educational opportunities to students from all backgrounds, and events like the Carnival will help to make education possible for many students. The East Hartford Town Council unanimously approved the Carnival on July 16. For more information, contact Matt Engelhardt, mengelhardt@goodwin.edu, or visit www.goodwin.edu. On Tuesday, July 9, Goodwin College officially opened the Riverside Farmers’ Market, which will be available to the public every Tuesday from 3 – 6 p.m. through October. Goodwin’s Riverside Farmers’ Market is a participant in the Farmers’ Market Nutrition Program for WIC and SNAP recipients and senior citizens. Goodwin is also offering free services and consultations to market customers. Shoppers can have their blood pressure checked and learn about yoga and other exercise programs, among other services. Futtner’s Farm and Unity Farm, located in Glastonbury and Manchester respectively, provided a wide variety of fresh produce and welcomed a crowd of customers. Honora Futtner, wife of fourth generation farmer Jim Futtner, explained that she is happy to be a part of this collaboration. “This is in my town. I wanted to be among the first to do something cool at Goodwin. Goodwin has a great reputation for being community spirited,” Futtner stated. The Futtner family immigrated to the United States in the 1880s and was recently presented with the Century Award by the Connecticut Agricultural Experiment Station. Lauren Fahey, a 20-year-old college student, has been working for Futtner’s Farm for the past six years. “I’ve learned a lot about work ethic and nutrition. It’s been a great way to learn where food comes from and the importance of buying local rather than at a grocery store,” Fahey said. South Windsor native Stephanie Young came to “lend support and see what the market is like.” Young gave tips on recipes and the use of fresh produce. Howard Jacobs, a third generation farmer, his wife Cheryl, and daughter Kelly were at the market representing Unity Farm which has been in business since 1938. “Our farm is family owned and run; that’s why it’s called Unity. It is the most rewarding thing to see customers purchase our produce. We put a lot of sweat and hard work into our business,” Jacobs said. Unity Farm has been participating in various farmers’ markets for 35 years. “They have become much more popular. People want to know where their produce is coming from,” Jacobs explained. Fresh produce and the awareness of healthy eating has become a positive epidemic which farmers like the Futtners and Jacobs hope will continue. “There has always been a need for fresh produce, but there is an increased awareness now. I think it’s really important for people to learn about nutrition,” Futtner said. Goodwin also boasts a Community Garden on Main Street, where gardeners are given a place to grow fresh fruit, vegetables, flowers, and other plants. The Garden serves as a symbol of the College’s efforts to benefit the East Hartford community. Sandy Pearce, Goodwin College’s Web Master, put a lot of effort and hard work into the implementation of both the Community Garden and the Riverside Farmers’ Market for the benefit of those at Goodwin College and in the community. Continuing with the theme of healthy living and community outreach, Goodwin has decided not to charge a booth fee for vendors at the Farmers’ Market, but asks that the vendors consider donating unsold food to the Transitions Food Bank, the College’s food pantry for students and families in need. A large amount of produce grown in the Community Garden is donated to the Pantry. For more information on the Farmers’ Market contact Sandy Pearce at 860-727-6754. Goodwin College has expanded its offerings for Adult Continuing Education, a program that provides learning opportunities free of charge to area seniors. Classes are held at Goodwin College, One Riverside Drive, and at the East Hartford South End Senior Center, 70 Canterbury St. Courses are offered through the Spring, Summer, and Fall. For GPS purposes, attendees should route to 211 Riverside Drive, East Hartford, for all classes offered at the College. The teachers who will be conducting these courses have a wealth of knowledge in the classes they are teaching and are excited to share their expertise. Preregistration is required for all classes. Anyone interested in taking a course or in teaching should contact ACE Coordinator Mary Ginnetti at mginnetti@goodwin.edu. ACE first launched in September of 2012, seeking to give seniors and residents age 55 and older an avenue for continuing to learn and be academically active. Continuing its theme of community outreach and healthy living, Goodwin College will open a weekly farmers market on Tuesday, July 9. 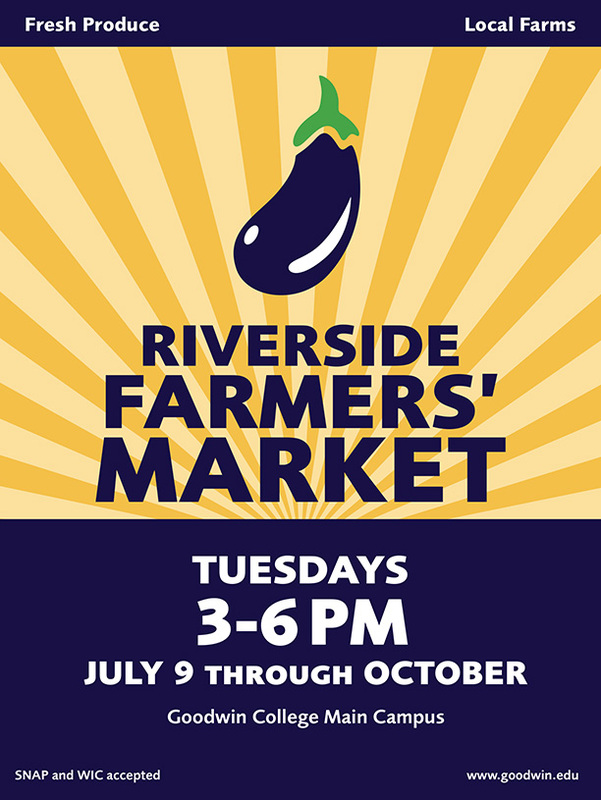 Every Tuesday through October, the Riverside Farmers’ Market will offer local residents, students, and workers a place to buy fresh veggies. SNAP and WIC are acceptable payment methods at the market. The market will take place in the Goodwin College Main Campus parking lot, 211 Riverside Drive, from 3-6 p.m. Futtner’s Family Farm in East Hartford and the Manchester-based Unity Farm will both be selling vegetables. Additionally, the College will welcome a variety of organizations dedicated to healthy lifestyles, offering free services and consultations to market customers. Among other services, shoppers can have their blood pressure checked and learn about yoga and other exercise programs. The Farmers’ Market is the latest in Goodwin’s community outreach efforts. In 2012, the College opened its Community Garden on Main Street, offering a place for gardeners to grow fresh fruit, vegetables, flowers, and other plants. The Garden has become popular with local residents and workers and serves as a symbol of the College’s efforts to beautify the local East Hartford community. A large amount of produce grown in the Community Garden is donated to the Transitions Food Pantry, the College’s own food bank for students and families in need. For more information on the Farmers’ Market, visit www.goodwin.edu or contact Sandy Pearce at 860-727-6754. Bill Magnotta, Director of the Goodwin College Center for Magnet and School Choice Leadership, was honored recently for his efforts in helping an East Hartford school grow from inception into an award-winning institution. Goodwin’s Bill Magnotta, left, is honored by CIBA Principal Art Arpin. Magnotta, previously the Program Manager of Interdistrict Magnet Schools for the State Department of Education, was recognized at the Connecticut International Baccalaureate Academy commencement ceremony held on June 21. Principal Art Arpin presented Magnotta with the Friend of CIBA Award, given in honor of service to the school. In his former role with the state, Magnotta was involved in helping the East Hartford Board of Education develop the CIBA program. From conception to construction to curriculum, Magnotta was instrumental in helping the school in every facet. Located adjacent to East Hartford High School, CIBA has become nationally recognized and the Washington Post recently named it the best public high school in the state. As an IB school, the curriculum matches that of similar institutions throughout the world. Now, Magnotta is a key component of the Goodwin College Magnet School system. Goodwin, the home of the Connecticut River Academy, will soon open the Goodwin College Early Childhood Magnet School, enrolling children in prekindergarten and kindergarten programs. In 2014, Goodwin will also open the new home of the Pathways Academy of Technology and Design, a magnet high school currently operating out of Windsor.